Are you wondering: Does my Tripawd dog really need a harness? You’re not alone. Most people wonder if a harness is really necessary for a three-legged dog. The answer to that question is that it depends: on the age, size, physical capability, living conditions and travel frequency of your Tripawd. Since all Tripawds lead different lives, they have different harness needs between puppyhood and senior days, depending on their current state of health. To help you decide if your Tripawd dog needs a harness, and which one may be best for you, here is a quick summary of the harnesses we think are best for Tripawds, and why. A good fit is achieved by working with any of the five different adjustment points. 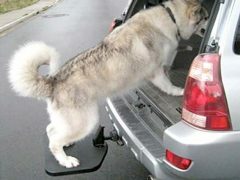 This is why it works great on both front and rear leg Tripawds. 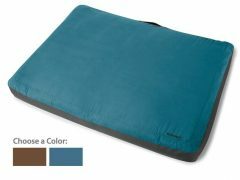 The strategically placed top handle allows you to help your dog through a variety of conditions if needed, while the breathable, rugged fabric is comfortable enough to wear all day, every day, even while urinating. A sturdy D-ring on top allows you to secure a leash, which makes it handy for going on walks. For complete details about this option, read our full Webmaster harness review featuring front leg amputee Jerry or watch our updated demo video with rear-legger Wyatt. 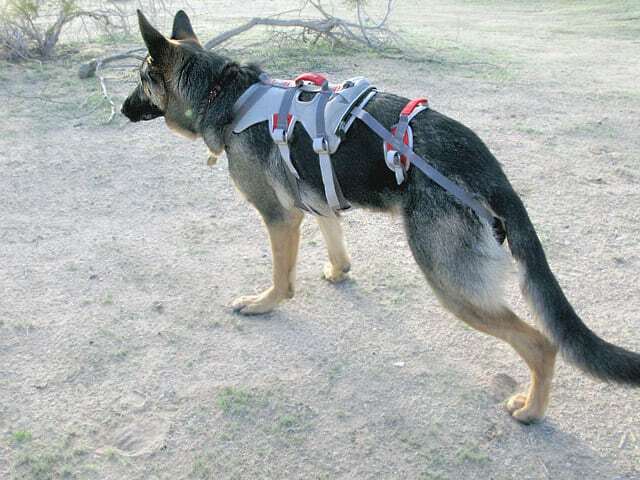 Once you try it we’re certain you’ll see why it’s our #1 selling harness for Tripawd dogs. 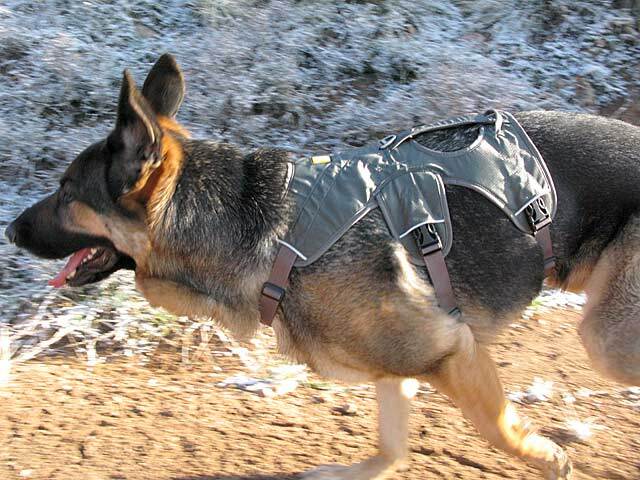 The Tripawd® Convert Harness by EzyDog is an ideal walking and adventure harness for any dog. It’s especially great for front-leg Tripawds and is the only harness we know of that was specifically prototyped on a front leg canine amputee. Can be worn during elimination. While this harness does provide support for assisting your dog into cars and up and down stairs, we specifically recommend it as a walking harness. The EzyDog is not intended for use as a safety or mobility harness that allows you to frequently lift your dog or hoist him entirely off the ground. 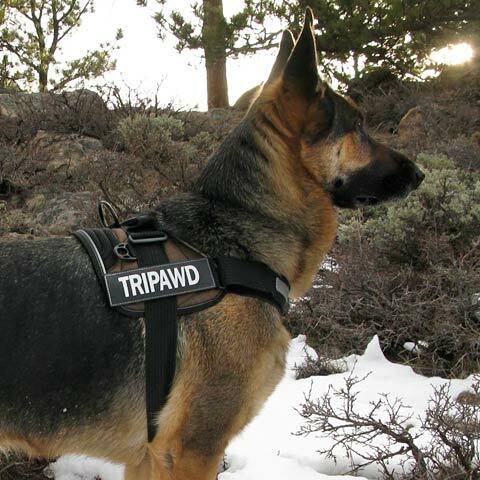 Read our entire Tripawd® Convert Harness Review for more information. If your dog is experiencing significant mobility challenges, the Custom Pet Support Suit by Animal Suspension Technologies is an excellent investment for long-term support and assistance of both front and rear leg Tripawds. This custom designed Pet Support Suit made to order for your dog’s specific measurements. It is also an excellent idea for people who have mobility challenges of their own and need help maneuvering a less ambulatory dog. 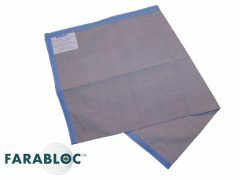 A soft, padded wrap underneath the belly area makes it ideal for immediate post-op use. 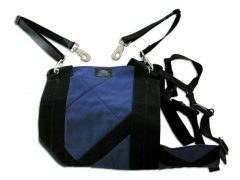 Adjustable, detachable handles so your Tripawd can wear it 24/7 if necessary. It also features heavy-duty, washable fabric, but we don’t recommend leaving it on your dog all day if you live in a warm climate. Because the Custom Pet Support Suit is tailor made, there are no returns. For details, see Jerry’s original Custom Pet Support Suit review and video. 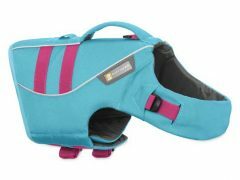 Like the Pet Support Suit, the Get-a-Grip is useful for pet parents with their own mobility challenges; an optional shoulder strap provides extra leverage when lifting or maneuvering your dog. Read our Get A Grip harness review and see demo video for details. 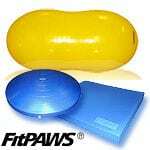 Choose the AST Get-a-Grip Total option when you need a variety of ways to help your dog in various situations. This “Total” option includes a Get-a-Grip harness, shoulder strap, and clip-on handles. This is an ideal solution to help maneuver your dog immediately post-op as well as when she’s getting into the car, walking on slippery surfaces and performing weight-bearing activities. Read our Get A Grip product review and see this demo video for details. 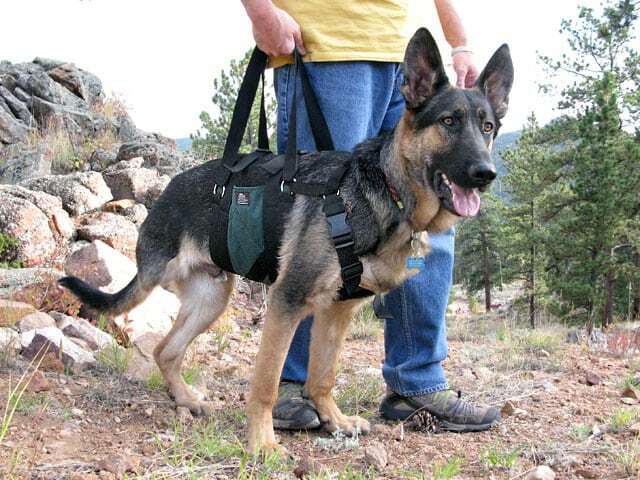 The heavy-duty Doubleback harness is great for active front leg amputee dogs needing rear-end lift and support. It provides all of the benefits of the Webmaster harness but has extra support on the rear half of the body, through the incorporation of leg loops (which can be stowed inside the harness when not being used). Keep in mind that the Doubleback is not ideal for rear-leg Tripawds who need rear-end lift support, since the leg loops cannot be used on dogs with small or no stump remaining. It does not feature quick-release buckles like the Webmaster, but can be worn all day and during elimination. Read the full Doubleback harness review for details. Get Front Range Harness here! Remember, there are no harnesses manufactured specifically for three-legged dogs, but these are the best harness options for canine amputees that we know about. As new ones appear we’ll be sure to let you know which harness is good for a Tripawd. If you have a favorite harness we haven’t mentioned, contact us today, we’d love to hear about it! Tucker, my nine year old lab, is a front leg amp. The Ruffwear Webmaster harness has been very helpful on walks – especially on rough or slippery terrain – and getting him in and out of the car. Tuck gets lots of compliments on his harness – and I have provided the link to the Tripawds website to anyone who has asked. Thanks for the great feedback and for spreading the word Linda! I don’t know how we would have gotten our rear tripawd, Murphy, through his recuperation from total hip replacement without the Ruffwear harness. He literally lived in it for the first month and then did all of his rehab for the next three months using the harness. He still thinks he “needs” it for going up and down the ramp into the car, even though we don’t have to hold onto it. Aloha! My husky mix, Samson, has a front leg amp from Osteosarcoma and has been getting along great, but has had some trouble getting in and out of the car because he can’t quite get his rear legs all the way up. I’m considering a harness for this problem but also because he was also recently diagnosed with bladder cancer. He currently weighs about 70 lbs and I weigh about 100 lbs and am 5″ tall. I can’t quite figure out which type of harness might be best because – 1) I’m worried about his abdomen getting pressure because of his bladder, 2) I’m not sure what would be best for a short/small person to lift /carry a large dog, especially as he gets weaker and I may need to do more than just lift him in and out of the car, and 3) I need the ease of being able to take the harness on-and-off fairly quickly and easily (we live in a tropical climate). Thanks so much! Hi Michelle. You’re asking great questions, Samson is lucky to have you for his pack leader. That’s a tricky situation. I was going to recommend the Pet Support Suit but then you mentioned that you’re tropical. It’s a little heavy for that kind of climate. So far the Webmaster Plus sounds like your best bet. Feel free to contact us directly with any other questions OK? Best wishes to you and your pup, keep us posted. What do you recommend for my little Westie. She is a front leg amputee, as of three days ago. We’d like to give her the lift support of the handle type, but she’s too close to the ground. We would love any help with this you could provide. Dolly is a large blue heeler mix. Two months ago, she had her left front leg amputated due to a stage 1/2 cancerous tumor. Last week, she pulled a muscle in her right front leg. She’s on muscle relaxants and taking it easy for now. I don’t want her to reinjure herself. She loves car rides, and can get in the car herself. She’s having problems in that its painful for her to exit the car, so it takes me a long time to coax her out. I use hard cushions as steps to make it easier for her to get in and out of cars. Dolly weighed 74 pounds today at the vets and lives in central Texas where the Temps are in the 100rds in the summer. What do you suggest? Hi Mary, Sorry to hear that Dolly is having challenges. We would still recommend the Webmaster harness for her, and if you’d like, the Ruffwear Core Cooler would be a nice addition for her in your climate. Just be mindful that when it’s wet and cooling her off it will leave damp marks on upholstery so you want to keep your car seats covered when you put it on her for car rides. One last thing you might want to consider: rehabilitation therapy. A good therapist can show you the best ways to manage her physical challenges and the best part is that the Tripawds Foundation may even pay for Dolly’s first visit. Good luck and we hope she gets well soon! We recently adopted Tonka, a 7 year old pit bull mix. She had her right front leg amputated in January of 2017. She is overweight and I am concerned about stress on her remaining front joints – we are having a lot of difficulty on walks, she tires quickly and will lay down wherever we are walking. What harness would you recommend? We are in Florida so it does get very hot. Hi Stephanie. Thanks for adopting Tonka! She’s a lucky girl to have you looking after her well-being. It does sound like she needs to lose weight to increase stamina. Have you considered a visit to a rehab therapist who can show you how to help her drop those pounds? The Tripawds Foundation may even pay for that first visit so we hope you will take her. Meanwhile keep in mind that harnesses do not “support” a dog to help them walk. Harnesses help the human assist the dog. The best one I would recommend is the Webmaster, which is a very breathable harness for hot weather. Feel free to call or write with any other questions. My american pit bull recently had to have his front right arm amputated all the way to the shoulder bone. It has been tragic for us and I need a harness that will help balance him while we walk him to rehabilitate him. This looks like exactly what we need! I am so thankful that you have this available and now I am just trying to find the link to order ours. Best wishes for your pup! There are links above for each of the harnesses described. Find them all on the Tripawds Gear Shop Page! Hi Jim. Technically you could use any of these harnesses in the car by running a seat belt through it. However, they are not crash-tested so you’d be doing so at your own risk. 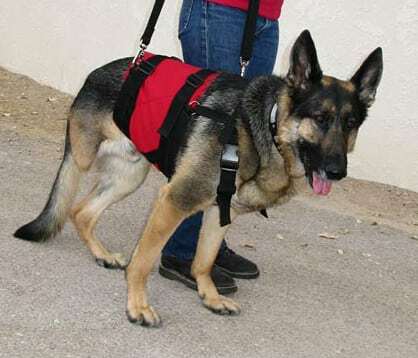 As far as we know, there are no assistive harnesses that can double duty as a device to help your Tripawd in everyday life as well as a restraint device. For crash-tested harnesses we recommend Sleepypod. Hello All. We have Murphy, a 3 year old Mini-Dachshund front leg amputee that we adopted a year ago. He is doing great! The problem we have is that all the harnesses we have tried he can very easily slip or “Back” out of. His nick name is “Houdini”! He is roughly 13-14 lbs. Dachshunds have deep chests so we always have to get a larger sized harness to accommodate him. Any recommendations would be greatly appreciated! We have referred to the Ruffwear Web Master Plus as Houdini-Proof! 🙂 For small breeds we recommend the Front Range harness. Hi there! THANK YOU SO MUCH FOR THIS INFO! I have a particularly tricky girl here, she’s a front leg amputee but had it removed as a 2 month old pup and has NO problems getting around, but our HUGE issue is that she PULLS like a maniac! At 63 pounds and with a huge pit bull head, she draws all her power from her giant muscley neck and shoulders and we haven’t been able to find a harness that won’t just twist to the side or be completely useless! We hate putting a neck collar on her because she hurts herself. She doesn’t need any lifting support, and can jump like 5 feet in the air- she just needs something that won’t slip off due to the missing front limb. Would the TRIPAWD CONVERT HARNESS by ezy dog be best for this still? Thanks for your time! You are wonderful! That’s a toss-up in this case then. The Web Master is often referred to here as “Houdini-proof” as dogs are less likely to escape from it. But if you do not require the additional lifting support, the EzyDog is a great walking harness that is quick and easy to put on and take off. Both may shift around the body slightly on dogs missing a front leg to hold it in placed. When sized correctly this is a minor issue and mostly aesthetic. Hi, I’m interested in buying a harness for my beagle who has three legs. He has two hind legs but one front leg which is his left leg. I’ve had him for a number of years. We had a big backyard for him but now that I’ve moved I need to walk him. He weighs about 29 pounds average. Though he likes to sleep a lot due to his age when I do walk him he is still very strong and pulls quite a bit, especially when he grabs onto a scent. What would be the best harness for him? Front range? Did not know because of his size. Appreciate your help. Hi, I’m interested in buying a harness for my beagle who has three legs. He has two hind legs but one front leg which is his left leg. I’ve had him for a number of years. We had a big backyard for him but now that I’ve moved I need to walk him. He weighs about 29 pounds average. Though he likes to sleep a lot due to his age when I do walk him he is still very strong and pulls quite a bit, especially when he grabs onto a scent. What would be the best harness for him? Front range? Did not know because of his size. Appreciate your help. Thank you. Hi Diana, it was nice chatting with you on the phone, I think you’ll find the Convert harness can work well for a dog his size who doesn’t need much lifting or assistance. HELP. my 10 month old husky is an escape artist missing her front leg and we have now gone through 3 harnesses she’s escaped from. Which harness would be best for her??? Wyatt is an escape artist himself, and has never slipped out of his Webmaster Plus! The best harness I found – after buying and trying several is the Help Em Up harness. It allows me to loop the leash from the front to the back and can guide with one hand while supporting her back end. Best one by far – that saved her stress and my back! Hi, I have a 7 yr old Rottweiler that was diagnosed with osteosarcoma in his front right leg. We went thru chemo and biophosphenate shots every 3 weeks for 5 Times, it should have been a total of 6 sessions but prior to last appointment we got an X-ray and it didn’t look good. He was limping and getting worse. We began pain med therapy, there was no change. We then made the decision to amputate which we said we would never do. Surgery was 1/23. He did get but then “crashed”, vet was able to stabilize him and seems to be getting stronger everyday. He should be coming home Saturday, 1/27. I am trying to figure out which harness will be best. He is a big boy at 122 lbs. we have another dog, actually his mom. We go on walks in the neighborhood often. We live in Pennsylvania so have the 4 seasons. Would you be able to steer me in the right direction? Best wishes for your pup! The Get A Grip and Custom Pet Support Suit are specifically designed for giant breed and extra large dogs needing additional support. 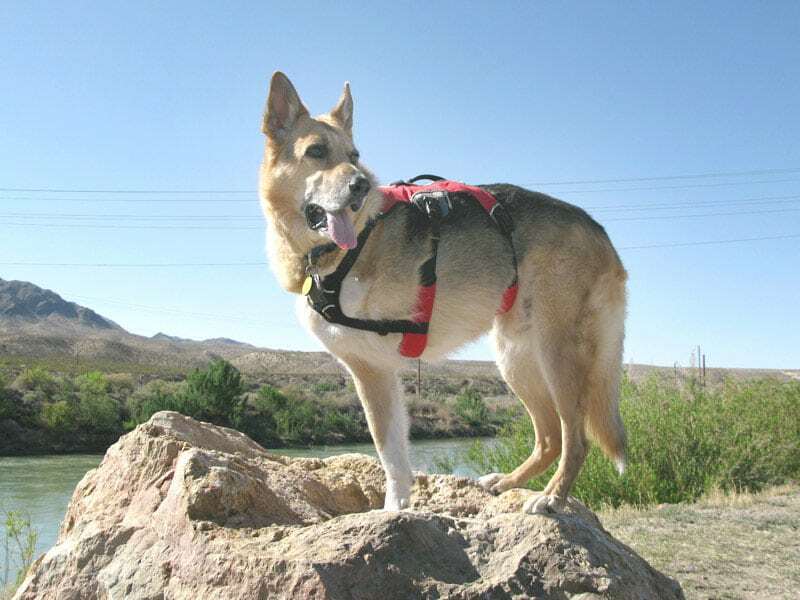 The Web Master Plus is the most popular all purpose support harness we recommend for most Tripawds. You can read complete details above. Most importantly, please consider getting a rehab evaluation by a certified rehab vet/tech for treatment and exercises you can do at home to keep your dog fit and strong! Visit a CCRT or CCRP and the Tripawds Foundation can even pay for your first visit. Hello. I have a new tripawd due to OSA. Left front leg amputated on Feb. 5. I ordered a webmaster pro right away; however, when it came, I was disappointed to find that there are not easy release buckles but metal buckles you have to fully release and then pull them back through the buckles. My 90 lb. German Shepherd tripawd is not going to have the patience to wait for me to pull these straps back through and over metal buckles. Do you know where I can find an OLD version like you had for Jerry and Wyatt? Thank you! Hi there! Sounds like the Webmaster Plus would be perfect! Someone on this community was so kind to us years ago when our tripawd needed a harness and we are looking to pay it forward. 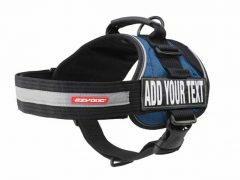 I have a large size Ruffwear Webmaster Harness available to someone who truly needs it. Send me a message! Maggie that is so generous of you. Please list your harness here in the Tripawds Angel Exchange, I know it will go fast, more people will see it there. Thanks! This is unbelievably helpful, thank you. Our 6 y/o golden Sassy has her surgery (Front limb) scheduled for this coming Tuesday, so we’re very new to this. I’ve opted for the Ruffwear Webmaster Plus. Thank you for the advice! Dolan you are SO welcome! It’s good to know there are still people who actually read 😉 We hope Sassy has a speedy recovery, keep us posted in the Forums! Hello there, my 10 year old Lab had her front leg amputated 5 days ago. Sissy is a barrel shaped lab that weighs about 85 pounds. I want to help her around, but is too heavy for me even with the assistance of a sheet or towel. I am in the market to purchase a harness. I am interested in the Webmaster. Do you have a recommendation for a big barrel shaped lab that is going to need lifting? Thank you. 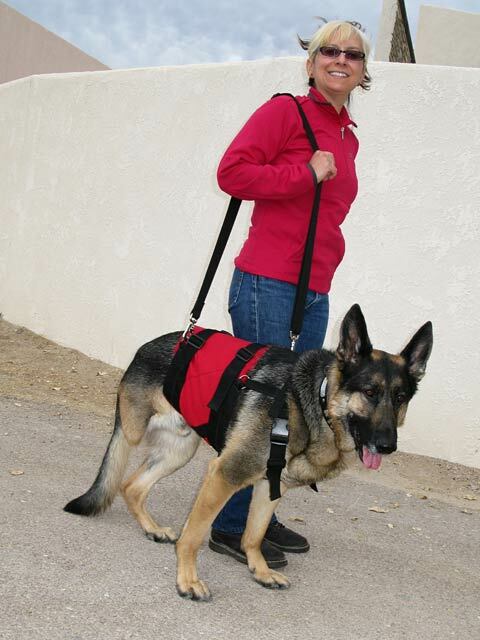 The AST Get A Grip harness is better suited for heavy dogs and those requiring additional lifting assistance. The Custom Pet Support Suit is best for barrel chested and dogs that do not specifically fit the Get A Grip measuring instructions. 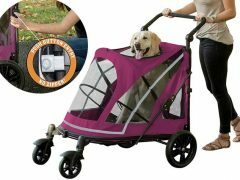 Both of these also offer an optional shoulder strap for help lifting heavy dogs. Hello! My 13 year old front amp has been suffering from vestibular issues. How unfair for a 3 legged baby 🙁 I’m looking into harnesses to maybe help her walk outside to go potty. She’s about 50 pounds. What do you recommend? Thank you!! 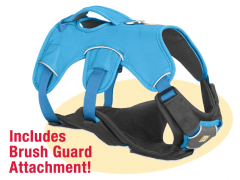 The Web Master Plus is the best all purpose support harness we recommend for most Tripawds. The AST Get A Grip (or Custom Pet Support Suit) with shoulder strap are recommended for less mobile dogs requiring much more support. Complete details can be found above in this post. Best wishes for your senior gal. I live in the UK. I WISH TO BUY YOUR Equipment so can you tell me if there UK importers of your products? Which “equipment” Derek? AST harnesses are available for shipping world wide. All other products have links for purchasing elsewhere if not available outside the U.S. Find international Ruffwear dealers here. Hello! I have a front leg, 5# tripaw and I’ve had difficulty finding the right harness for him. Any reccomendations? Hi KaryAnn! 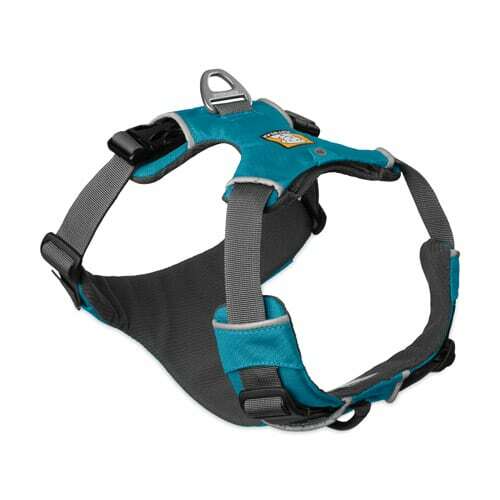 For small breed Tripawds we recommend the Ruffwear Front Range Harness. Let us know if it works for you! Hello. I Have a small lurcher who is very fast and very active. She is missing her front right leg and has a very muscular left shoulder to compensate. I find that some coats and harnesses tend to rub her armpit and leave it sore. Which harness would you recommend for a very active dog? The Ruffwear Web Master Plus Brush Guard attachment in the best recommended all purpose support harness for all Tripawds. The harness is designed for a comfortable fit on active dogs, and the Brush Guard adds additional support. I have a newly adopted 3 month old beagle puppy. He had his front left leg amputated about a month ago. All the shelter knew was that he had a horrendous fracture upon arrival….sadly the leg wasnt able to be saved. We have taken him out on several occasions using a regular around the neck collar and leash. As he is becoming more curious and as all beagles, a constant sniffer, we have been considering a harness. He is very well behaved, but curious…..what harness would you suggest that may be able to at least partially grow with him but not restrict him or have him run out of it? The Web Master harness or Web Master Plus Brush Guard is the best recommendation for most Tripawds. While he may eventually outgrow it, all the straps can be adjusted to make it larger as he grows, until he is ready for the next size. Hello. I have a 2.5 year old American Staffordshire Terrier that is a front leg amputee. He has problems being led by a leash, he tips over easily. The rescue group that we got him from used one of those head collar leads that go over the nose/mouth. He does ok with it, but I’m wondering if you think he would do better with a harness? Or would being dorected from the body make him tip over even easier? Hi Rachelle. Funny you ask: I just had a conversation with someone about this very issue. And what I recommended for a dog who tends to pull, or walk fast as front leg amputees will do, is to use a head collar, aka Gentle Leader. Thank you so much! I just wanted to make sure we were using the best thing for him. We have a 13 yr old Yorkie. It’s been 1 week as a front right leg amputee. He is struggling with being able to get up then walk much at all. He also has rear leg weakness. He’s really off balance. Do you believe a harness would help and which one do you recommend? Any harness will only help you provide assistance as needed. We have discovered the Front Range to be the best fit for toy breeds. You best option, however, is to consult with a certified canine rehab therapist who provide a proper evaluation and prescribe treatment and exercises you can do to help you old pup regain strength and remain strong. Visit a CCRT or CCRP and the Tripawds Foundation can even pay for your first visit! You will find details about all the top recommendations above. The Web Master Plus Brush Guard is the best all-purpose support harness suggested here for most Tripawds. W recently adopted a front leg tripawd greyhound. She is 5 yrs. old and about 55 lbs. (Interestingly, whoever amputated her did not take off the leg at the shoulder: she has a stump.) She’s very athletic; jumps on and off furniture and can go up and down a few stairs. However, we have to pick her up to get her in a car. What harness would you recommend? It would also be nice if she could get better on stairs and could get some support when walking on a leash. Hi Peggy, thanks for adopting your girl, she sounds like a lot of fun. And so smart of you to help her get into and out of the car. You’re doing so much to help preserve her joints. Based on what you’re describing we recommend The Web Master Plus harness. It’s the most all-purpose assistive device perfect for active Tripawds like yours. Bark if you have any other questions!